A 3 in 1 Commode Can Offer High Versatility While Offering Safety and Confidence. 3 in 1 Commode - your answer to nature's call. 3 in 1 commode - a no frills, bells or whistles unless you pay extra for them necessity. This is your basic bedside commode, a removable, washable bucket that sits in a metal frame that generally comes with adjustable legs to fit various heights. You sit on a regular toilet seat and can even put the lid down if you need to. Hand rails allow for ease in standing and sitting. As their name implies, 3-in-1's offer 3(+) uses. In no order of importance: using it by your bedside, putting it OVER your existing toilet to offer height and arms, using it in your bathtub as a shower chair (or tub transfer bench). Bedside use: Answering mother nature's call can be tricky when injured or ill. Weight bearing status, obesity, weakness, balance issues or poor endurance can make getting to the bathroom impossible. In this situation, your toilet bedside commode is used precisely for that - bedside. Getting to and from requires less, energy, movement and hassle. However, prolonged use by the bedside can lead to further weakness and sickness since your patient is no longer having to walk any further each day to gain strength. It is advised to place your commode at a 90 degree angle beside your bed (i.e. facing parallel to your bed) This angle is the shortest angle you can make to get from point A (your bed) to point B (your commode) and can be accomplished with a low pivot transfer. . Some think that placing the commmode facing the bed is better but now, your tail end has to swing 180 degrees from the bed to the chair... that is twice as far as a simple 90 degrees. 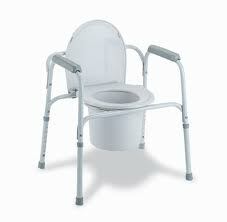 Adjusting your 3 in 1 commode higher or lower allows for ease of movement up and down from the commode. Taller people (especially with a total hip replacement) will want to rise their commodes so they do not violate the 90 degree rule. Shorter people may not need to make such adjustments. Do remember that the taller the toilet bedside commode, the easier it will be to get on and off of it. Some won't want a toilet beside their bed and I don't blame them BUT, as much as I love what I do, I would rather meet you in the mall or the grocery store instead of at home because you fell trying to get to the bathroom! I would rather see this type of bathroom safety equipment by your bed and see it migrate to the bathroom over time.